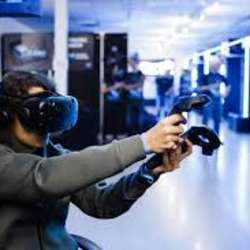 Let Discover this Virtual Reality Arcade Together. You must be a member of the Calgary Professional Networking Group to attend this activity. Would you like to join this group? Join us for an evening of Virtual Reality fun. This is going to be a fun evening full of laughs and exploration - your inner child is sure to come out. We'll have Pizza/Drinks and discuss our professional goals for Protected content . Space is limited so be sure to sign up today!